Geologically it is a young Sea; it has undergone enormous changes since the last Ice Age. 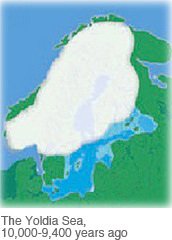 At the end of the Baltic Ice Lake period, about 10 000 years ago, saline water intruded into the area, forming the Yoldia Sea, which covered mainly the present Baltic Proper and the Gulf of Finland. 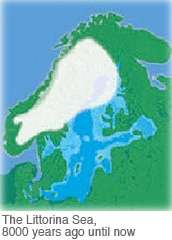 At the end of this phase, only limited areas of stagnant ice remained in Sweden, and a progressive upheaval of land cut the oceanic connection to Baltic Sea basin, changing it to a fresh water basin – the Ancylus Lake. Because the continuing uplift was greater in the north, the floor of the lake tilted and a new contact with the ocean was established about 7 500 years ago, resulting in the Baltic Sea as we know it today. There are a limited number of species that can live and thrive in brackish water. Although both saltwater and freshwater species have adapted to the brackish waters the diversity of species is less compared to oceans where the salinity is 3.5%. This is one reason why the ecosystems in the Baltic Sea are extremely sensitive. If one species would disappear because of loss of habitat due to pollution, oxygen depletion or invasive species that take over territories, it could have a tremendous effect on the general status of the Sea. With less salinity there are fewer species, usually also smaller in size. For example a Bothnian Sea Blue Mussel is ¼ the size of the same species living in the ocean. Some fish, for example Salmon, Eel and Garfish, that travel between low salinity waters to the ocean, need estuaries to adapt to the changing conditions. Another particularity of this Sea is the heavy ice in the winter. 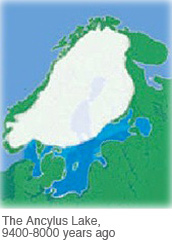 The ice layers in the northern part can expand to depths of 25 meters. This makes it difficult for perennial vegetation to survive, which is the reason why in these areas annual plants prevail. The ice is a necessity for the Seal who needs it for reproduction. If for example the ice should no longer form in the winter, the Seal could no longer survive and the marine plant life would significantly change. This would in turn bring about a number of changes that are unforeseeable today. The marine fauna can be divided in to four groups: freshwater, salt water, brackish water and ice age relics. In the Baltic Sea proper, there are about 70 species of fish of which not all can stay and reproduce in the area. For the flora it can be concluded that the further north the fewer species. The Baltic Sea has few kinds of mammals but many different kinds of birds, both migratory and stationary. 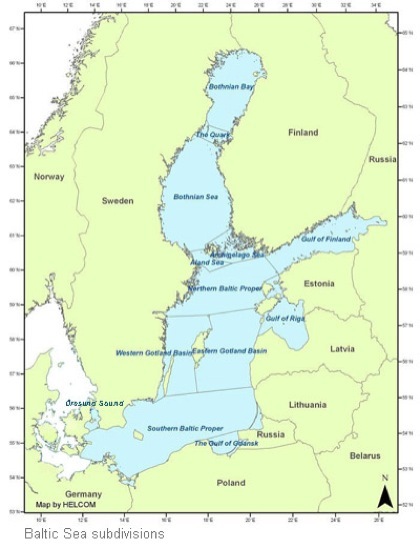 It takes about 35 years for all of the water mass in the Baltic Sea to be exchanged due to the extremely narrow and shallow outlet to the North Sea. This is another reason why the ecosystems are so sensitive. In addition, the low temperatures (3-4°C on the sea floor) trap contaminates and pollution that accumulates for a long time in the sediment as well as in animals and vegetation. The Sea has always had great importance to humans. It has been a source for food, used for transportation and unfortunately also as a garbage dump. The general stance that what you can't see is not there has been prevalent. 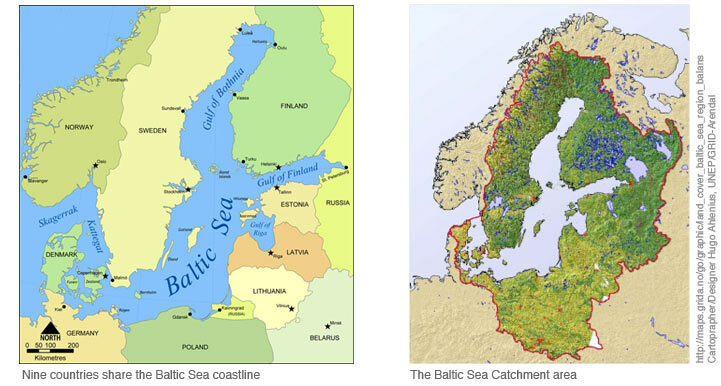 As late as 1950 the Baltic Sea was still regarded as environmentally "healthy". Large-scale industrialization had not yet made its impact, there were few automobiles, and intensive agriculture and forestry making widespread use of fertilizers and pesticides was only commencing. However, since then the situation has changed dramatically. Pollution now threatens the health of the water, land and air in the entire area - and ultimately the health and wellbeing of Fauna and Flora as well as that of Humans. About 16 million people live on the coast, and around 85 million reside in the Baltic Sea countries. The overall catchment area, with rivers flowing into the Sea, extends to part of Belarus, the Czech Republic, Norway, the Slovak Republic and Ukraine, meaning that an even larger area with more people influence the well being of the Sea. It takes several years for water, thus also contaminated water, to travel through the ground with the ground water. This means that even if all pollution stopped today, it would take several years before the Sea would start to recuperate. Different metals, pollutants and other foreign substances take varying times to dissolve and to get transported out to Sea. Eutrophication appears due to substances such as nitrogen, phosphorous and human sewage dispersed into the Sea. This creates intensified algal blooms which in turn leads to murky water, more oxygen depletion and even less life on the sea floor which all have strong negative impacts on biodiversity. Anoxia, the oxygen depletion on the sea floor makes impossible for most current species to survive. Overfishing is a problem largely due to poor political management of fishing quotas. State subsidized fishing in many countries makes it easier for the over fishing to continue. If the price of fish corresponded to the price of supplying the fish the demand would significantly lessen. Fewer species would be threatened. The sea floor and ecosystems are altered because of fish trawling. The destruction of sea floors disturbs many species habitats and upsets the ecosystems. Repeated trawling prevents life to return to the areas and can result in permanent damage, like lifeless sea floors. Illegal fishing and not respecting set quotas. Very low fines for illegal fishing makes it financially worthwhile for the offenders to continue. Spreading of invasive alien micro-organisms introduced via ships’ ballast water or hulls. Some species not originating from the Baltic Sea take over habitats and nourishment from existing species. This threatens them in some cases with extinction thus completely altering the ecosystem. New methods of cleaning ballast water will in the future greatly improve this problem. Some damage is, however, already done. 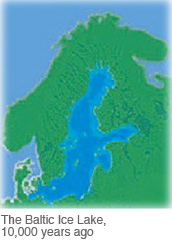 Organic contaminants from various industries and agriculture are traveling to the Baltic Sea through the ground water. Oil spills and hazardous substances and other wastes from vessel traffic. Regulating and changing the flow of rivers for water power, affects reproduction of certain fish species. Logging in coastal areas affects the water quality. Litter on beaches and coastal areas sometimes takes over 100 years to dissolve. Noise from leisure boats disturb fish habitats and bird’s nesting. Unintentional capturing of birds and mammals during industrial fishing leads to unnecessary loss of lives. Dredging and sand quarrying alters coastal areas. Wind power construction affects the wildlife. Large waves from passing vessels lead to beach erosion. Chemical war weapons dumped in the sea. Mercury in fish makes them hazardous to eat. Radioactive pollutants dumped illegally into the Sea. Water contaminated with contraceptive medication flushed in to the sea causing fish to become sterile. Sewage pumped directly out into the Sea from leisure boats. Sandblasting and cleaning the hulls of large oil tankers and dumping the waste water without filtering it directly into the Sea. Installation of a gas pipe line on the Sea floor disturbing the wildlife and its habitats. These problems need to be addressed in different ways and now more governments, environmental organizations, researchers and companies are getting involved. We salute all and everyone taking active steps towards a recovery of the Baltic Sea. We want to give special attention to the Marine Protected Areas, since this is a unique way for selected areas to regain poise, here we also feel we can help make a difference. The effect of protecting the Baltic Sea area is also beneficial for other regions further away since many species migrate. A change in the number of a certain species then affects the biodiversity in the migration areas as well. Areas to be chosen for protection should have a certain ecological significance, for example areas with higher importance for migratory species, areas of reproduction, feeding, biological productivity and variety. Other important regions to protect are areas where threatened and/or declining species live as well as geological or geomorphological structures and sensitive areas. The purpose for these areas should be to protect species, natural habitats and nature types in order to conserve biological and genetic diversity. Species should have a potential to live and the possibility to increase in numbers. There should be no fishing or hunting nor any disturbance of the wildlife. Protected areas are established by the Natura 2000 and Emerald networks whose purpose is to ensure conservation from an overall European point of view. 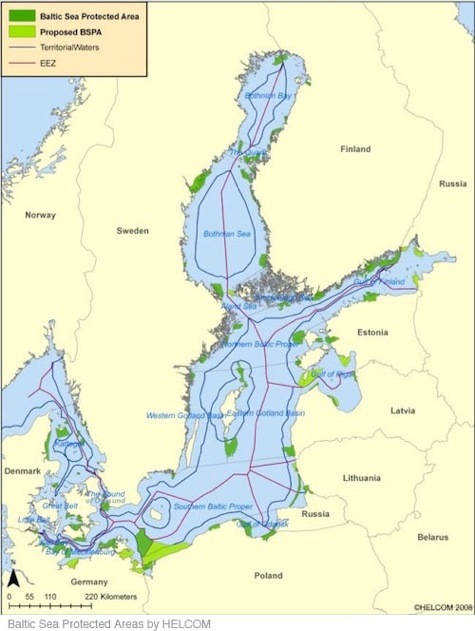 Another is the BSPA (Baltic Sea Protected Areas) designated by HELCOM with the specific aim to protect the Baltic Sea Area only. The two networks of conservation may have areas designated for conservation that coincide but they are not necessarily the same. Managing protected areas is filled with conflicting interests. The delusion that economical gain and short term advantages would excuse for for example ravaging sea floors that may never recuperate or polluting the water on one side. On the other side a wish to ensure a sustainable use of natural resources in line with conservation of the environment and biodiversity. The following undertakings should be regulated in these areas: Extraction of natural material, oil and gas exploitation, dumping of solid waste, constructions, emission of waste water and polluting substances, aquaculture, transport, military activities, submarine cables, fishing and hunting, tourism an recreational activities. To succeed in protecting the areas it is necessary to clearly state the goals and the management methods and spread information about these to the public locally and internationally. Surveillance, enforcement and deterring punishments should be set and implemented. Using pesticide in your garden can end up polluting underground water, lakes, rivers and ultimately the Sea. There are many non-toxic alternatives, both home made recipes and commercially sold products. Avoid disturbing the wild life, especially at reproduction time. Get involved in marine nature conservation. Don’t eat Baltic Sea fish too often, the Sea is very polluted and fish are contaminated especially fish with high levels of fat like Salmon, Herring and Eel. Do not release any pet fish, amphibians or snakes NOT belonging to the natural fauna of the Baltic Sea area as it could do much more harm than anyone can imagine. Rather bring them to the pet store or local zoo as they would have better knowledge of how to treat them. If you find a species that you suspect might not be part of the natural habitat, please contact an environmental organization or the authorities and inform them of this possibly hazardous invasion. Old medication no longer used should be returned to the Pharmacy, do NOT flush it down the drain as it can seriously harm the marine life. Few sewer systems are equipped to filter out medication particles and hormones. Do not pour any kind of chemicals into the water sewage system. Please ask the local authorities or the hardware or paint store if they accept old paints, white spirit and/or other chemicals. For leisure boating, prefer sailboats to motorboats. Think about driving slowly when close to the shore to avoid making waves that may disturb species living on land as well as in the water. Wastewater should never be pumped directly in to the Sea. Do not litter, never throw anything overboard. Make sure that the motor does not leak gas or oil. Use only environment led free boat paints to paint your boat. Before moving a boat by land from one body of water to the next make sure to wash the surface not to involuntary introduce bacteria or species that do not belong in the new area. Avoid eating fish that are on the red list here below. Please note that detailed information on the fish marked as a blue link can be found on the pages in Artwork & Sea Life Facts. Please do not keep fish that are too small. All species need to reach a certain size to be able reproduce. Make sure you know the minimum size for the species you are interested in. Wild Salmon: Caught with a fishing rod, net or fishing line. You recognize the wild from cultured salmon because it still has its fat fin. Salmon compensatory hatchery releases with cut fat fins are an attempt to increase the Salmon stock. These are safe to fish. Plaice: Usually caught by net. Cod: Ice fishing and deep sea fishing can get caught by net. Eel: Caught with a fyke, fishing lines, Eel nets etc Eels are threatened with extinction, never keep Eel. Whitefish: Caught with a fishing rod. Swordfish: Extremely rare in the Baltic Sea but a very popular sports fisherman fish, caught by fishing rod. Never keep a Swordfish if you caught one. Lamprey: Caught with a fyke, fishing lines, Eel nets etc. A fish threatened by extinction, never keep Lamprey even if they are a parasite fish and look scary. Monk fish: Rare in the Baltic Sea, caught with a fishing line. Eel pout: Caught with a fyke or fishing line. Lump fish: Caught with a fishing line, now a rare species in the Baltic Sea. Carp: Caught with a fishing line or angle fishing. Carp Bream: Caught with a fishing line or angle fishing. Four horned Sculpin: A bi-catch when fishing with a net; often not for human consumption, but it is nevertheless a good tasting meat and people make good use of its roe. Perch: Caught with a fishing rod or angle fishing. Pike: Caught with a fishing rod. Sprat: Usually fished commercially by trawling but can be caught small loop nets. Garfish: Caught with a fishing rod. Zander: Caught with a fishing rod. The problems in the Baltic Sea are not just a decreasing population of Cod and invasive algae blooms. The mix of numerous problems makes the situation very complex and each problem area must be addressed with specific approaches. It is our goal to create more attention to the general condition of the Baltic Sea and its inhabitants. We strive to increase the knowledge of the multitude of species living in this Sea and their conditions for survival by improving the understanding of marine wildlife and its importance to us. At Living in the Baltic Sea we want to inform people of the necessary measurement needed for the maintenance of Marine Protected Areas as we believe that if they were properly acknowledged and respected it would greatly help local ecosystems to recover from human influence. They would function as local vitamin injections to the Sea and the healthy areas would spread. Reasonable fishing would be possible close to these areas but not in them. A commitment to sustainable marine development is about ensuring prosperous economies, healthy societies and dynamic ecosystems in a balanced and integrated manner. We believe it is possible.